Author: Katja Werthmann. Series edited by: Thomas Bierschenk, Anna-Maria Brandstetter, Raimund Kastenholz, Matthias Krings, Carola Lentz. Since the 1980s, West Africa experiences a gold boom. Men, women and children work in the informal mining sector, with their hands and simple tools only. Focusing on the case of the rural southwest of the country, the present book takes a closer look at economic, social and cultural aspects of the gold boom, giving peasants, prospectors, state officials and small-scale businesswomen a voice. The book also puts clichés of “lawless places” and “thoughtless splurging” into question. The present volume further describes conflicts concerning the acquisition of land and natural resources as well as the social organization of mining towns. On the one hand, gold mining leads to conflicts concerning rights of use and individual agency, but on the other hand it provides economic change and alternative ways of living and world views. On the occasion of the gold boom, relations between men and their environment, cosmologies as well as relations between generations and sexes are re-defined. The excessive consumption in the mining towns is a form of redistribution which contributes to the social embedment of the mining itself. This book presents a contribution to the socio-scientific and comparative research of gold fever-phenomena, to the ethnography and history of West Africa, the relation between land rights, local power structures and the state in Africa, as well as to the ethnology of money. Dr. Katja Werthmann taught at the Institute for Cultural Anthropology and African Studies of the Johannes Gutenberg University Mainz and qualified herself there as a professor with this thesis. From the winter term 2012/2013 onwards she holds a position as Professor for Gesellschaft, Politik und Wirtschaft at the Institute of African Studies of the University of Leipzig. Für den Rezensenten besonders faszinierend war, wie die Autorin zeigt, wie sich aus anfangs anomischen und ziemlich schrecklichen Verhältnissen binnen kurzem entgegen allen gängigen Vorstellungen vom „Goldrausch“ einigermaßen stabile und belastbare politische, ökonomische und soziale Strukturen herausbildeten – und dies sowohl in der Goldgräbersiedlung selbst als auch in den Interaktionen zwischen dieser und der älteren Nachbargemeinde. Ethnologische Feldstudien, die solchen Wandel dokumentieren, sind leider immer noch die Ausnahme. Besonders bewundernswert ist daneben natürlich der Mut, den die Autorin aufbrachte, als sie ihre Forschungsarbeit in diesem explosiven Umfeld bis zum Ende durchzog. 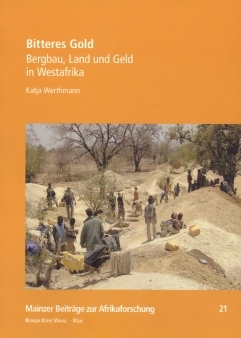 [...] the book provides a comprehensive anthropological assessment of artisanal mining in West Africa and adds to the more economic-driven research carried out with the support of the Collaborative Group on Artisanal and Small-Scale Mining (steered by the World Bank and DffD). Werthmann provides excellent insights through her long quotations from interviews with key informants and discussions with actors from the various groups within and outside the mine. [...] In particular her section on ‘women in the mining camps’ (pp. 187-205) is very informative and documents clearly why females voluntarily work in the mines and the associated businesses. The songs of the women operating the manual stone crushers (pp. 201-5) provide helpful insight into the paradox young women are facing in rural West Africa and documents well their capacity for irony and growing confidence. The study has the potential to contribute to a better understanding of how people organize and make sense of their actions in situations of sudden economic opportunity and change. So this book is a contribution in the social sciences and in comparative studies of gold rush phenomena, to the ethnography and history of West Africa, on land rights, local power structures, and state in Africa, and to the anthropology of money.